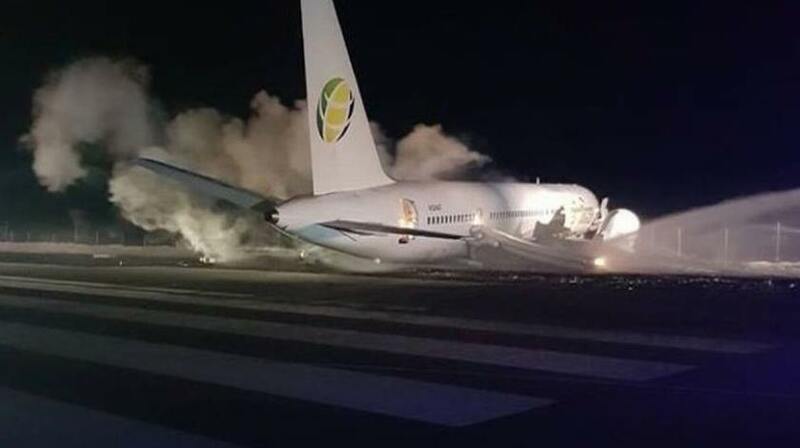 Fly Jamaica Boeing 757, performing a flight from Georgetown to Toronto with 120 passengers and 8 crew on board, has crash-landed at Cheddi Jagan Airport, officials said. According to the reports, all passengers are safe. 6 out of 128 people on board receivedminor injuries and were sent to hospital. According to reports, some time after taking off the pilot indicated the aircraft was experiencing technical issues and requested a permission to turn around to its departure airport. The aircraft landed on runway but overran onto soft ground. The aircraft stopped only after crashing into a fence with its front wheel wedged in a pile of sand being used for the ongoing airport expansion project, at the end of the runway. “We can confirm that Fly Jamaica flight OJ256 bound for Toronto has returned to Georgetown with a technical problem and has suffered an accident on landing. At this time, we believe that all 118 passengers and 8 crew members are safe. We are providing local assistance and will release further information as soon as it is available,” the airline said in the media release.